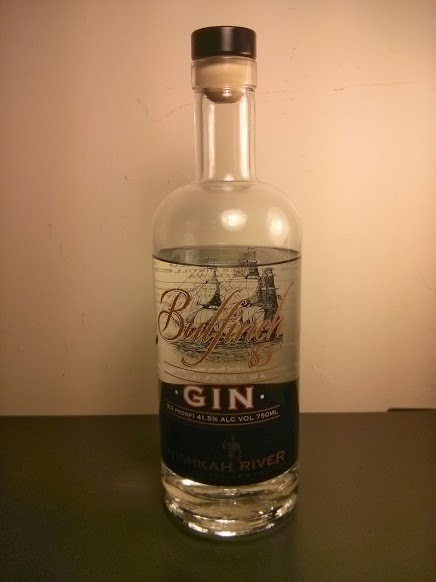 Bulfinch 83 gin is a gin in the “craft gin” tradition. The base spirit is their very own neutral grain spirit, distilled from Washington grains. Reminder that in Washington “Craft” is actually codified in law, meaning that more than 50% of the raw materials must have been grown in the state. So craft? Sure seems it. Let’s get down to the tasting. The nose of Bulfinch 83 Gin is bright, orange and lemon, citrus as well as juniper. A tinge of alcohol, but generally mild and very much in the spirit of gin. The taste begins a bit quiet on the palate. Quiet citrus undertones on the initial taste a dash of cardamom, juniper builds in the middle, with notes of licorice and fennel, herbal and a bit quiet. The tail brings with a dash of heat, while still being very mild, slight dash of lemon and cardamom again on the finish. Nice and well balanced, leaves a slight warm tinge on the palate, but shows restraint and balance the whole way through. The gin and tonic reduced the complexity a bit, juniper and cardamom dominate, but in a very pleasant way. I enjoyed it with tonic syrups, though found it a bit overcome by some. Cardamom comes through most strongly on the tail, depending on the brand. In the gimlet, there’s quite a nice balance coming through, citrus and juniper and a sweet almost chai like note on the finish. I quite enjoyed this drink. I have to say, I really loved Bulfinch 83 in a martini. Nicely balanced, smooth, and everything I loved about it neat well represented in the cocktail. Highly recommended. The Campari overpowered it a tad in the Negroni. To bring out more of the gin, you could opt for a 2:1:1 ratio, and you’d get a bit more cardamom, fennel, licorice and juniper. If you’re a purist about the 1:1:1 ratio you might not get as much out of the gin as you’d hope for. I’d suggest representing the gin a tad more strongly in the Negroni. Also great in the Aviation and Moonlight cocktail, as well many other classic cocktails. Well rounded, and works great as a cocktail gin, but also smooth enough to be drank neat on its own. I’m quite a fan of Bulfinch 83 Gin, and despite its proof it does indeed have a fairly bold and flavorful profile. A great cocktail gin; Bulfinch 83 Gin is a worthy addition to any home bar. Tried your gin in Orlando last year at the Eagles convention. Really enjoyed it, compares to my favorite, BomBay Gin. Would really like to hear when you get a outlet in San Francisco Bay Area. Don’t suppose you can ship to Calif. Finally found and bought this today. Very unique and “outside the lines.” Often a gin so boldly different turns me off. This has a great spiciness and warmth, but still somehow retains a lovely soft mouthfeel. Reminds me quite a lot of Rolling River Gin (Portland, OR). If you haven’d reviewed that yet, I highly recommend it. Thanks for all you do. You are my first search when I come upon a gin I haven’t tried. Cheers.